Saturday’s opening round, modified alternate shot, finished with only eight teams under-par. The duo of Nick DiPietra, of Weston, and Marc France, of Plantation, fired an impressive 68, four under-par, to lead by one stroke. Three teams, Tony Vento and Kasey Denesevich, Gregory Diederich IV and Diego Ayala, and Joseph Solenski and Paul Humbert, finished tied for second place with a score of 69. After a small break for lunch, the teams teed it up again for round two’s two-man scramble. Scores were drastically lower but no one could shake DiPietra and France from first place. The team of Cody Olson and Kaleb Johnson advanced from fifth place to second with a round two score of 63, two shots out of first place. DiPietra and France shot five strokes less than their first round and finished the day with a total score of 131. Five teams tied for third place with a two round total of 134 including duo Joseph Solenski and Paul Humbert. Round three, on Sunday, tested the players’ skills in 18 holes of four-ball. A change occurred at the top of the leaderboard after Solenski and Humbert posted the low score of the day, five under-par 67. Round one and two leaders, DiPietra and France, fell from their number one spot to tied for second place after a round three score of 71. Partners Daniel Eggertsson and Ben Adelberg, posted a strong round two and three score to finish tied for second place, 71-63-68—202. Solenski and Humbert lingered close to the lead after day one with scores of 69-65 and pushed to the top after round three. 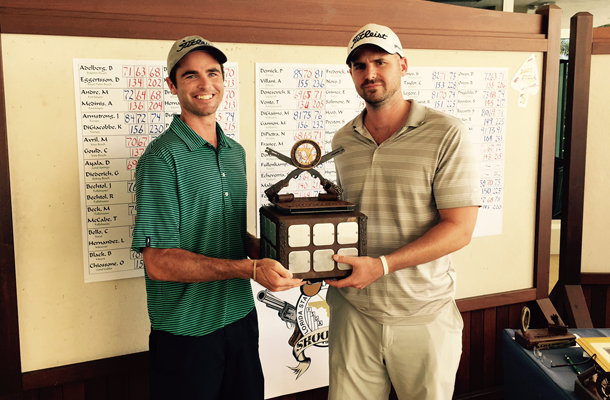 This marks the first FSGA victory for both Solenski, of West Palm Beach, and Humbert, of Miami. The field of 51 teams played three competitive rounds consisting of modified alternate shot, two-man scramble and the final 18 holes of four-ball. All three rounds were played on the Equestrian Course at The Polo Club of Boca Raton. The highlight of the tournament occurred during the last round when Diego Ayala aced the par three, 166 yard, 11th hole. Solenski and Humbert outlasted all three formats and captured the 2015 Two-Man Shoot-Out! 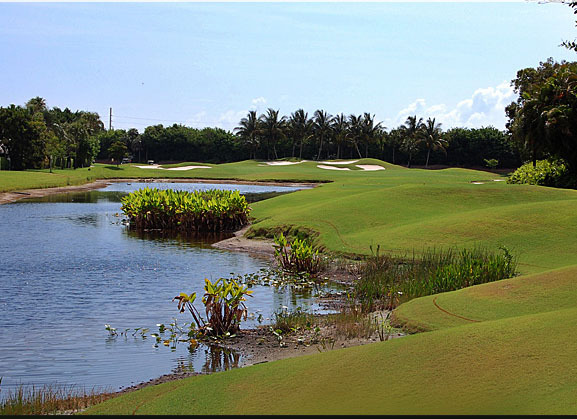 The Polo Club of Boca Raton, located in Boca Raton, is hosting the 2015 Two-Man Shootout, one of the FSGA's most casual and enjoyable Championships! It is also a unique Championship combining modified alternate shot, two-man scramble and four-ball formats. Each round is considered a separate competition with prizes being awarded for each, as well as an overall winner for the Championship. Grab a partner and enjoy spending a weekend in the heart of Florida's Atlantic Coast. Enjoy four miles of beaches, the best restaurants in the south, and three rounds of golf at the prestigious Polo Club! For a look at the 2014 Two-Man Shootout results click here. Male amateurs must both be members of the FSGA. Late entries are subject to a $10 late entry fee should the entrant gain acceptance into the field. Entries will be accepted based upon the order of receipt. Entries received after the competitive field is full or after the close of entries, will be placed on an alternates list. Alternates will be contacted in the order of receipt of entry, if and when, a spot becomes available. The golf course will be set-up at approximately 6,600-6,800 yards. Play-Off - For overall team Champion only. The format for the play-off is a three hole aggregate with each form of play used on one hole. If necessary play will continue on a hole by hole basis rotating the form of play. It is the team's responsibility to be present for any play-off. Each round of the Shoot-Out is treated as a separate competition and gift certificates are awarded for each round. There is an overall prize for the team Champion, but the emphasis and the majority of gift certificates are paid out on the basis of each individual round. After 36 holes, the number of flights will be based on the number of teams and the range of scores. Practice rounds are available on the Equestrian Course one week prior to the Championship on a space available basis. The price for a practice round is $30 plus tax. Please call (561) 995-1150 to arrange your practice round. The proper place to practice your golf swing is on the driving range, hitting multiple shots on the course is unacceptable. Carts are included for all competitive rounds. Players are responsible for practice round fees. Jimmy Jones Jr. and Christian DiMarco captured the 2014 Two-Man Shoot-Out at Lely Resort Golf and Country Club in Naples. Jones and DiMarco posted scores of 72, 61, and 67 to win by two strokes over Donald Wolfe III and Matthew Cheezem. Spectators and Spectator Cart Policy - Click here. Caddies - If a player employs a caddie, the caddie MUST walk and player's clubs must remain on the golf cart. Championship Pace of Play Policy - Click here. Local Rules and Conditions of Competition - Click here. Championship Policies - Click here to read the withdrawal, dress code, and other policies. Procedures for Alternates - Click here for information on how alternates may gain entry into this Championship. Conditions/ Schedule - The FSGA Championships Committee/on-site Rules Committee reserves the right to alter any of the conditions, provisions and/or schedules. The decision of the Championships Committee/on-site Rules Committee in any matter will be final. $109 plus tax per room, per night. Hotel is approximately 5 miles from the Polo Club of Boca Raton and right next to the Town Center at Boca Raton and Town Center Mall. Home of Rocco's Tacos & Tequila Bar, Sushi Ray, Brio Tuscan Grille, Morton's The Steakhouse, and numerous other Restaurants. 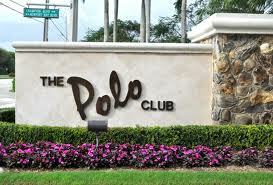 The Polo Club of Boca Raton accepts Cash, Visa and MasterCard for method of payment. Click here for more information on The Polo Club of Boca Raton.